Reaching the river delta is the hardest endeavor Wayne has ever undertaken. The challenges that he faces some days are very overwhelming, yet God is moving mountains to advance this ministry. It is a big river with communities lining its shores where there are no churches, and the Word of God is not spoken. This year we have acquired an aluminum boat with a 25hp motor to get us out on the river. This boat has enabled Wayne to move teams and reach farther than he has ever before. The deeper he forges into the river delta, the more dangers he discovers. 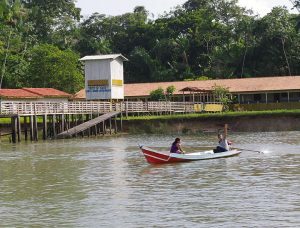 The Amazon River is no tame body of water but a treacherous landscape of nautical hazards and pirates. There are days that the river is filled with debris that include sunken trees just hiding below the surface. Several of these have already tried to rip the motor off the back of the boat. Then there are boulders under the surface of the water you will never see that have already taken a chunk out of the prop. As you go through your day, please remember to keep Wayne in prayers as he navigates the river and the Lord takes him places that stretch him far beyond his comfort zone. In America, it ‘s hard to get involved in people private lives. It is the same here in the river communities. The families are closed, and it takes time to worm your way into their lives, but that is the task of a missionary. To build these relations over time so that they trust you and listen to you as you share about the God you serve. As you develop these relationships, you end up deep in the middle of some of these families. One such person is Cordero. He asked me to be his best man at his wedding recently. It was an enjoyable learning experience for us. Here in Brazil, people do not get married at the church. They have civil weddings as specific locations in the city, or sometimes a judge will do group marriages for the poor. The new couple is now good friends and participating in our small church group. Pray for us as we seek the Holy Spirit to open these doors of relationships for us. Our volunteers can get so excited about telling the Greatest Story Ever Told, God’s Story. It is awesome to see average church attendees who have shied away from evangelism because it is just too confrontational for them. They are then transformed into enthusiastic story tellers sharing their faith and truths in the Bible by just sharing a simple story. This is why we hold Bible Story Training weekend seminars out at our home. It is an environment that a couple can attend with their little ones or friends looking for an opportunity to learn how to share their faith. These seminars have not only helped people grow as individuals but have been the main stay of our recruiting efforts for our river ministry teams. At this time we have four teams working with us on river ministry targets. Please pray that we can arrange more of these events and add more ministry teams to our movement. The river ministry is not much different than any other ministry. It is all about relationships that last over an extended period. 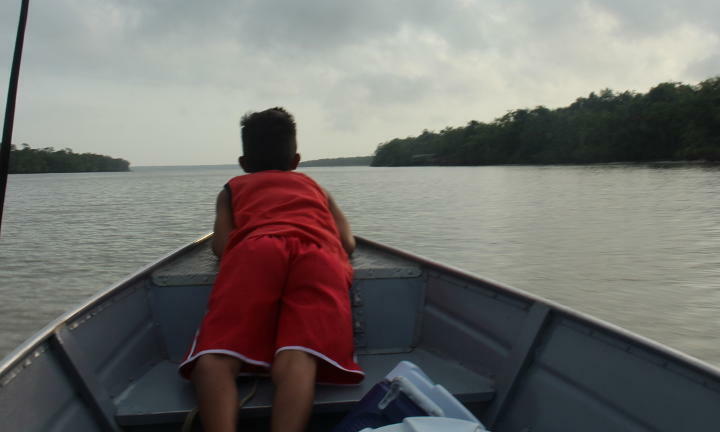 The families that are out on the river live in somewhat isolated communities. This makes developing relationships harder than those that live in the city. When you enter a community you are not trusted, many strangers have done harm in these communities both religious and governmental. This is why they are wary of strangers special white men from foreign countries. This is one reason Wayne recruits people from the local city churches for help. They are still strangers but a lot less strange than Wayne. The color of the skin is one characteristic that sticks out along with the accent in the language. 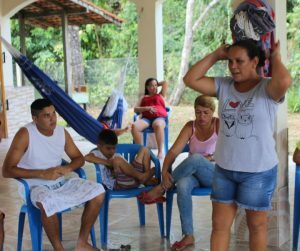 The goal in working with locals on these projects is to try and help them build a relational bridge into these peoples lives quickly. Wayne understands the process and seeks to disciple the volunteers he is working with in this ministry. It is a slow process, and many mistakes are made by these novice volunteers, but it is amazing how the Holy Spirit can use all these mistakes and turn them into advantages. One strategy Wayne teaches to his volunteers is to use the story cloth as a contacting tool. It works so well in this culture. Through the cloth on the table and the first question out is; “What Is That?”. From there the conversation becomes very natural as the first story is told. Pray for these workers of the harvest and their story cloths. God has blessed us with a great local teammate. Jeu is a modern day river pastor. 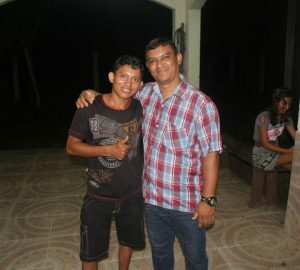 He comes from a family that is many generations deep in Christ with an extended family of pastors and church leaders. He has his aluminum boat with an outboard motor, so he can get around quickly to make visits to parishioners on the river. This modern day boat makes him a target on the river. He has had his boat stolen a few years back. He is praising God that they only took the outboard motor and abandoned his boat on the river shore. God then blessed him with a new 20 hp motor that helps keep him moving. As he has partnered with us and his boat is included in the deal. He no longer visits parishioners with the boat but uses it to commute back and forth from his church on the weekends. 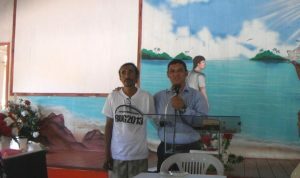 It is such a blessing for us that he can spend Monday through Friday working with us here on the island of Cotijbua and then on the weekends work at the Monkey Island Church. Pray for Jeu as he works the soil here. Remember to share this article with a friend. 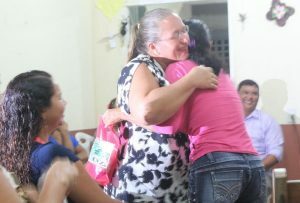 Our ministry here is a small and intimate where relationships are important. The island communities are not anything like the big city locations. 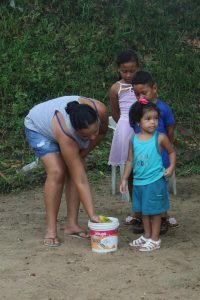 Many of the families here have been part of this small community for generations. This makes breaking into these families difficult because you are seen as an outsider. This is why we focus on small groups that can provide an intimate atmosphere that can be positive and uplifting. The culture here has a lot of negative attitudes built into it. It is well known that your life is worthless and individuals are dispensable. This is one reason there is a lot of domestic violence in the general society, and the newspaper is filled with photos of people assassinated on a daily basis. Our message that Jesus loves you and His sacrifice of His life to redeem you is one that is counter culture. One way to communicate the Grace Of Jesus is to develop a deep loving relationship with these people with Grace at the core of the relationship. The lives of these people are so filled with baggage that no one wants to love them as they are, but we do! Please pray that we have the strength to demonstrate the Grace of Christ as we live out our faith in this small band of believers. 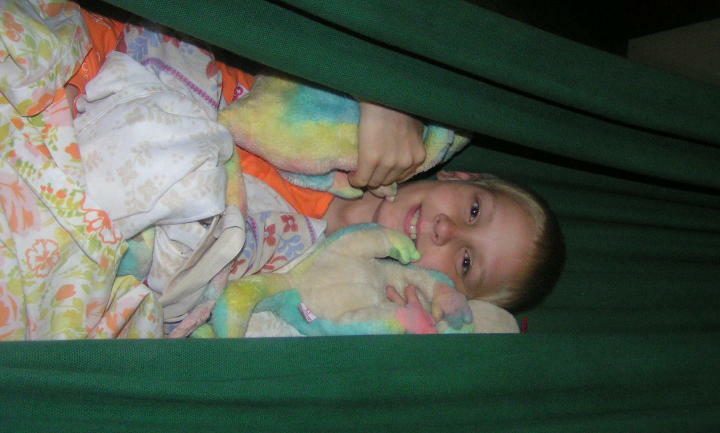 This is a classic photo of two of our kids when they were little sleeping in their hammocks. One of the things you learn as a missionary is to adapt to whatever situation you find yourself in. This also means your family as well. 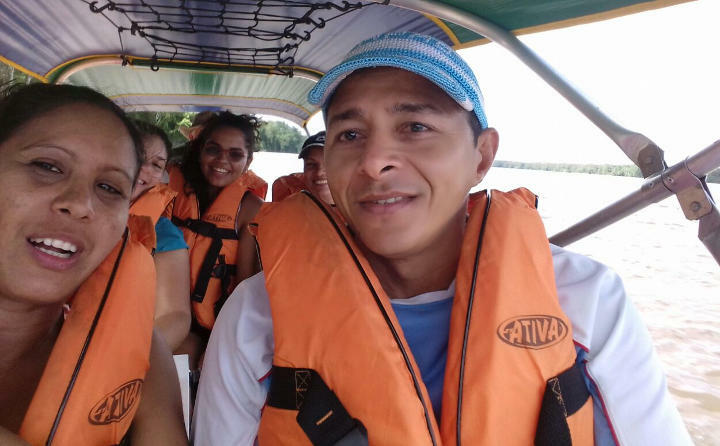 Our ministry here in the Amazon Delta always required a bit of travel to visit families in other river communities and we enjoyed taking our family with us. That is what the Brazilians do! This meant taking our own sleeping gear, like in the Sates when you go camping. Only here we hang from people’s walls. 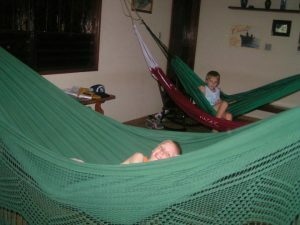 If you look closely at these hammocks you will see they are made out of a thick fabric, not light weight material you would find a parachute made of. There is a reason for this. They sell parachute hammocks that are light weight and can fit into your pocket if you have a large pocket. The thin material is great for travel but so thin the mosquitos can bite through the fabric. You will then wake up in the middle of the night with a very sore back and possibly contract some mosquito-borne disease. The thick fabric protects your backside from these vicious creatures. Pray for us as we travel in our hammocks. 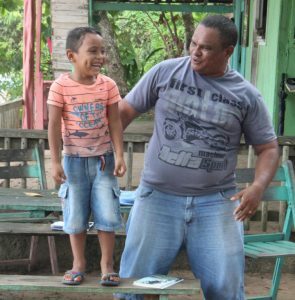 In January 2017 we took over a kids club on Farol beach on the other side of our island. There was a baptist missionary who had started this kids program about four months previously. They started it because they meet Stephine at a church camp and she accepted Christ at the church camp. 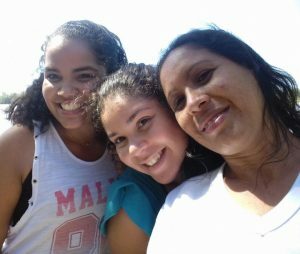 Now Stephine did not know us at the time and there was no other churches on the island preaching the Gospel and she wanted to reach the kids in the neighborhood for Christ. So she asked them to help her start a kids program at her house. For the Baptist missionary this was a six hour round trip each weekend and they could not find a local Baptist Congregation to take over the ministry. 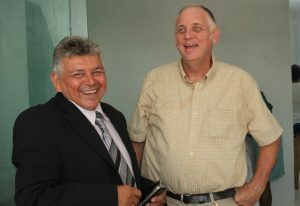 These missionaries are acquaintances of ours so they contact us about keeping the ministry going. We had been praying for the Holy Spirit to open a door for us on the other side of the island. This opportunity was an answer to years of prayers. Inheriting the kids program was the easy part, over the year we have developed three teams from three different churches to operate these kids club and we are training our leaders to reach into the community. This has now opened other doors such as a womens craft / bible storying group and one man named Roger who was baptized in June. It is amazing to see how Jesus is in control of the building His Church. Pray for the work at Farol (which translates as Lighthouse).